Not to be confused with the scales that our friend Lady Justice carries around with her everywhere, the scales of finance are a bit different in function. To truly weigh something, using a scale, you load up one side of the scale with that which you want to weigh and then put weights of a known mass on the other side. When the scale is balanced, you count up the known mass weights and you’ve got the weight of the item(s) on the other side. 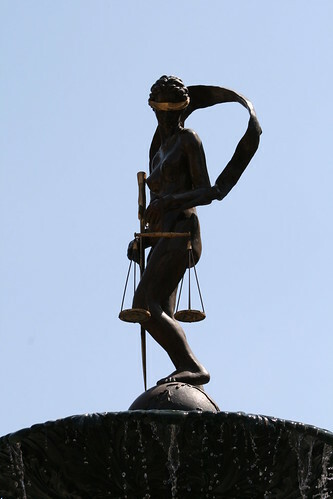 Lady Justice, as the story goes, does this by weighing a persons crimes and adding the appropriate amount of punishment to the other side so that the Scales of Justice balance. When we think about personal finance, there are those that are die-hard frugalers. There is no other way to save money, retire comfortably, or live, than by being frugal. The more frugal you are, the more you save, and the less you spend. Coupons are their best friends, as are black friday deals and places like farmers markets and flea markets. There are also those that are the die-hard incomers. Skipping a latte isn’t for them. The only way to get ahead is to make more money while not spending any more. They’ll work three jobs to achieve levels of income that were previously unheard of and use that added income to pay off debt and save for retirement. But, much like justice, the scale can pretty easily be tipped into unbalance. Frugaling, while a good idea, can only take you so far. Income increasing can only take you so far. Eventually, you’ll need to make a bit more money, or work less. The right way to do it is to strike a balance between the two. Cut your costs as much as you can, without going to extremes. Increase your income as much as you can, without going to extremes. Find a place where you can balance your financial life while still getting to live life and not be classified as a cheapskate work-a-holic. Create a budget. Know where your money is going (even if it’s going down the drain), and plan where you want it to go. Cut costs. A little bit of frugal living isn’t going to hurt you. Drop cable T.V. You can replace it with Netflix, or books. Find other things that you can do without completely or cut usage of. Analyze your finances. Use your budget to determine the inflow/outflow of your finances. How long to payoff your debts? Could it be accelerated greatly by taking on a second job? Maybe you only need a second job for 6 months to pay off a credit card. Increase your income. There are other ways, besides taking on extra jobs, to increase your income. Prepare for, and then ask for a raise. Sell off stuff you no longer use. Find a way to get paid for hobbies you already do. Don’t over-do it. Maintain focus on your end goal, but keep your sacrifices to a bearable level. All that extra income won’t do you any good if you burn out in 3 months because you’ve been working 80 hour weeks. And all the frugal in the world won’t do you any good if you burn out in 3 months because you’ve been manually separating the plys on your TP. Don’t think that just because you do all of this once, that you’ll remain in balance forever either. At first, you will probably benefit from regular weekly or bi-weekly check-ups. As you get more comfortable with it all, you might be able to do it once a month. Much more infrequent than that and you’ll lose your focus and begin letting things slip. If that happens, pick up where you left off and continue on. As you continue on, the Scales of Finance will become easier to balance. You’ll become better at it, and the scales will gain a little extra margin for error. It may seem hard now, but it does get easier. And, believe it or not, it can be fun.